THE Sinn Féin MEP for Dublin and National Chairperson of Sinn Féin, MARY LOU McDONALD was raised in Rathgar, Dublin. Speaking to ELLA O’DWYER at her Strasbourg office, Mary Lou outlines the vital role Sinn Féin plays in Europe. Her education and early work experience were to serve her well when she became an MEP in 2004. “Part of my university studies covered European economic policy. It’s amazing how life works out because those studies have proven very useful since I became an MEP. “Some of my earlier work experience also proved helpful when I got onto the Employment and Social Affairs Committee in Europe as I’d worked with the Irish Productivity Centre, an organisation which worked with unions, employers and government as a consultancy assisting people in the workplace in increasing productivity. Politics was always a topic of discussion in the McDonald household and particularly around the time of the 1981 Hunger Strike. Mary Lou found her political home in the Republican Movement after joining the Irish National Congress when she met members of Sinn Féin. “When I was in my 20s, a friend of mine invited me to a Fianna Fáil meeting and I went to a couple of more meetings but it was very clear I was in the wrong place. I never joined the Fianna Fáil party but I always had an interest in politics and I got involved in the Irish National Congress, which was a kind of broad front for republican organisations and individuals and I met people from Sinn Féin through the INC. In 2002, Mary Lou McDonald stood as a Sinn Féin candidate in the general election in Dublin West and polled 8.2 per cent of the vote. Part of the strategy was to strengthen the party in that part of the city. “The party wasn’t as strong in Dublin West then so we were running to try to build the organisation in that area. There were really good activists out there in the Joe McDonnell Cumann. It was my first time out as a candidate and it was a brilliant campaign, a great experience. We did quite well for a first outing and it broke the ground for the 2004 European election campaign. 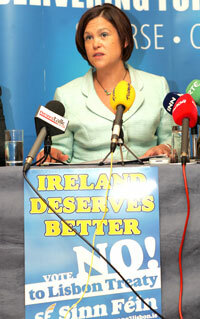 Mad or not, Aengus proved to be right and Mary Lou McDonald became one of Sinn Féin’s first two MEPs. While a lot of people may feel a bit removed from happenings in the European Parliament, the issues Mary Lou McDonald deals with brings home just how important it is to have active representation at European level. Mary Lou describes a day in the life of an MEP. “Well, today I arrived in the parliament at 7.30am and did some preparatory work, then I was in the chambers at 9am and spoke in a debate 9.30am. Mary Lou McDonald is held in high esteem in the European Parliament and a measure of that was indicated last year when she was short-listed for the ‘MEP of the Year’ awards by the European Parliament magazine, a first for an Irish MEP. The issues she deals with in Europe are clearly ones that have a huge bearing on her Dublin constituency. Being on the Employment and Social Affairs Committee in Europe means that McDonald is well placed not just to advance the best interests of the Dublin constituency but also to promote the Sinn Féin project. “I chose the Employment and Social Affairs Committee very deliberately because I’ve always had an interest in working in that area. Also because we recognise that issues around workers’ rights and safety are very important for Dublin. We also know that the trend for workers is for employers and their political allies to try to undermine rather than promote those rights. Mary Lou’s work on eradicating homelessness promises to impact in a very real way on the lives of Dubliners. “We’ve also been doing a huge amount of work on the problem of homelessness and the parliament has adopted a declaration calling for what is called a Winter Plan committing the parliament to put an end to homelessness within a given period. It also provides for securing food and water as well as shelter for people. McDonald identifies a certain fear and stagnation amongst mainstream parties in Ireland in relation to Europe, attitudes that she believes may explain the absence of serious debate in the lead-up to the Lisbon Treaty referendum. Mary Lou believes that Sinn Féin has a better handle on the issues and concerns affecting ordinary people than other parties and that this awareness will help the party in what will admittedly be a tough EU election campaign next year. Her enthusiasm and commitment to her work is an indication of just how important the work of a well motivated MEP can be and as Mary Lou herself says “It’s crucially important to have representation in the European Parliament in that 70% of the laws that impact on Ireland are born in Europe. So what fires her up? What keeps her going? Mary Lou says it’s the ability to bring about change. “It’s the belief that we MEPs can change things. I really believe that, if you’re committed enough, if you work hard enough, if your arguments are strong enough, you can bring about very, very significant change and shape our own futures. 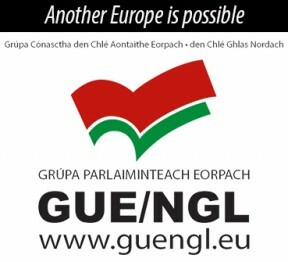 If ever was proof needed of that, you only have to look at the Lisbon Treaty campaign.